Former Palestinian Prime Minister Ahmed Qureia on Tuesday morning launched the historic Fatah congress in the West Bank city of Bethlehem, which is slated to elect the future leadership of the Palestinian movement. "In the name of the shahidim (martyrs) and in the name of Jerusalem, the capital of the Palestinian state, we hereby declare the opening of the sixth congress of our movement, the Fatah movement," Qureia said, standing next to Palestinian President Mahmoud Abbas. The Palestinian president went on to slam Israel, "which is denying all of its commitments." According to Abbas, the understandings reached by the sides with an American guarantee included all of east Jerusalem, the Jordan Valley and parts of the Dead Sea located within the West Bank. "But now the Israelis are trying to deny this and create a reality in Jerusalem, claiming that Jerusalem is united under their sovereignty," he said. "Although we have chosen peace, we maintain the right to launch an armed resistance, which is legitimate as far as international law is concerned." Abbas surveyed the history of the conflict, accusing the Jewish state of thwarting the Oslo Accords, and hinting to a plot which led to the start of the first Lebanon War, following the assassination of Israeli Ambassador to Britain Shlomo Argov. "An Israeli spokesman clarified two days before the Lebanon invasion in 1982 that if an Israeli would be hurt, even in London, they would not be committed to a truce and to understandings with the PLO," he said. He promised not to rest before the circumstances which led to the death of his predecessor, Yasser Arafat, are revealed. The conference is being held in the presence of some 2,000 delegates and hundreds of guests, including the Palestinian Authority's diplomatic corps, as well as the various Palestinian organizations and Arab parties in Israel. The congress is taking place on the backdrop of different groups' struggle over the membership in the movement's supreme institutions, led by the Fatah's Central Committee, which has been controlled so far by the guard of the founding generations. Israel and the entire world are closely monitoring the developments in Bethlehem, following reports that the conference will decide not to recognize Israel as the Jewish state in its updated platform, in addition to a decision on "a struggle using all means." Former Shin Bet chief, Knesset Member Avi Dichter (Kadima), even warned Monday night against a third intifada following the decisions made at the Fatah congress. The conference was convened after repeated delays, perceived by many as an attempt by the veteran leadership to avoid the convention, which may lead to the dismissal of many in the leadership from their key positions. Monday night and Tuesday morning saw senior Fatah members signing pacts, building coalitions and trying to recruit voters. "Someone spoke to that guy in Syria," "don't forget the one from Bethlehem, and "is the group from Jenin homogenous" are just some of the phrases heard in the conference hall and in the lobbies of hotels accommodating senior Fatah members. "The right of return is a sacred right which will not be ceded" and "the right to resistance is a legitimate right" are some of the slogans posted on the conference hall's walls, alongside pictures of the movement's deceased leaders, in addition to prominent activists who have been killed by Israel during the current intifada. The sixth congress is also being held on the backdrop of Hamas' attempts to prevent Gaza residents affiliated with Fatah from taking part in it, following a demand that 1,000 Hamas members jailed in the PA would be released. 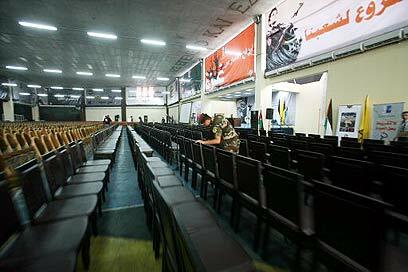 See all talkbacks "Abbas at Fatah congress: Jerusalem promised to us"